The internet hasn't been the happiest place for me lately. Over the past three years or so I've watched friends, colleagues and loved ones battle trolls; I've learned of tragedies, both personal and public; and I continue to deal with some extremely creepy people on a daily basis. I probably spend more time talking about and sharing things that make me angry than happy. But it can't be all bad, can it? There must be a reason, aside from work, that I spend so much time here. Something must make me happy. Enter Smile Suggest, a Chrome extension that helps you catalog the things on the internet that make you happy, and ignore the things that don't. Let's see what, if anything, can help me fall back in love with the internet. I don't actually smile that much, then. Most of the results were simple to understand. I know why I smiled at almost everything: Star Wars, fluffy animals, Firefly, funny videos, a Hangouts message with my S.O. and a feel-good story about a beloved mascot. There was one outlier: our Cooking with Watson article, which remains a mystery. Maybe I just find something about the combination of cumin, sumac and carrots pleasing. I mentioned the idea of saving a screenshot of the page to McAllister, who seemed receptive to the concept, and had been thinking about a more complex system to show you what on a particular page made you happy, so there's a chance that a similar feature will turn up at some point in the future. So what are you supposed to do with this list of happiness? Well, Smile Suggest has a few options. From the suggestions dashboard, you can share links to Twitter or Facebook, or add each page to a folder in your browser's bookmarks. It's a shame there's no option to automatically share hits to social networks -- you'd have to be very brave to automatically share everything that makes you smile, but it'd be a fun experiment, at least. Social options aside, the dashboard also lets you remove suggestions you don't agree with, which brings me to another problem. Although Smile Suggest does a good job working out what page you're looking at and when you're smiling, it was always watching me, unless I manually deactivated it. That means if something made me laugh in our office chat app and I had Chrome active in the background, it added whatever tab was open to my suggestions list. I lost count of the number of times I had to remove links from the list because of a funny tweet or throwaway comment in a group chat. McAllister says this behavior is not intended: He tested the extension exclusively on an older version of OS X and hadn't had this problem at all. He says he'll look into fixing it. There are a couple of other issues to get out of the way: First, there's the whole privacy thing -- this extension is straight-up watching you all day long. While the only permissions it uses are "Read and change your bookmarks" and "Read your browsing history," there's always a chance that someone will find a loophole to exploit. The final problem is it's a huge resource hog. With the extension enabled, my battery life was severely reduced and my MacBook Air's fans whirred way more often than they normally do. 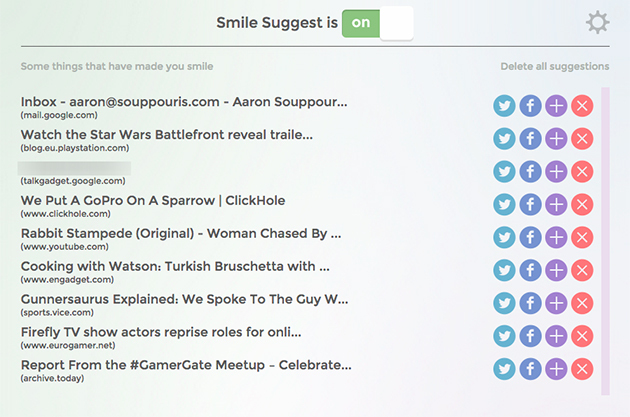 Smile Suggest hints at a future where apps make decisions for us, taking cues from our latent desires. Problems aside, there's a lot to love about Smile Suggest. We've been interacting with our computers in much the same way for decades. Even with the introduction of touch and gesture controls, there's still the basic cycle of deciding to do something, performing an interaction and actually having it happen. By reading your emotions, the extension completely subverts this status quo. McAllister notes it's different than the "slightly considered and contrived idea of a Facebook like or Twitter favorite. ... A smile is something that, on one level, is more honest ... much more immediate." For me, it hints at a future where apps make decisions for us, taking cues from our latent desires. It's pretty great, after a long day of work, to have a rundown of the things on the internet I actually liked. It's been so easy for me to end each day focusing on the negatives, rather than the positives. If its creator can fix the small niggles that, to be honest, are expected with a one-man project, I could really see the idea catching on. It could definitely be something I use every day. Something to make the internet at least feel like a nicer place.